Storms developing in the central U.S. will threaten the South through Monday. 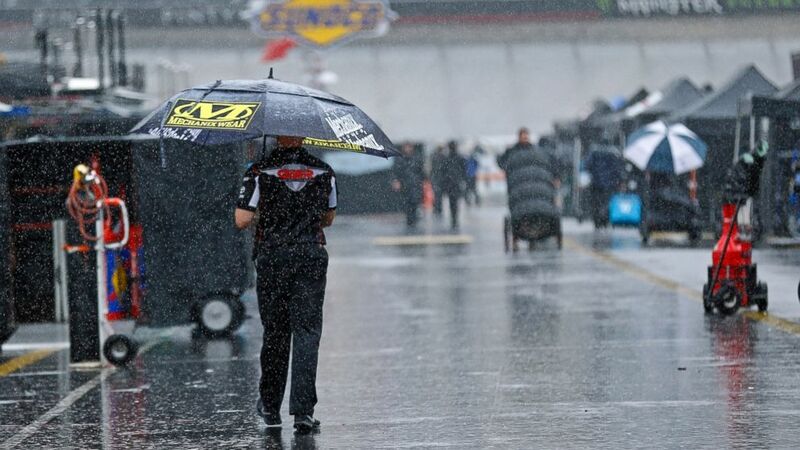 camera (AP) A man walks through the pit area as rain falls before a NASCAR Cup Series auto race, Saturday, Aug. 18, 2018, in Bristol, Tenn.
Strong summer storms caused 14 people to be injured at a Backstreet Boys concert in Oklahoma on Saturday night, and now another system developing in the same region is set to threaten the South and Midwest over the next two days. A new set of storm systems are beginning to take shape in the central U.S., which will bring possible flash flooding to parts of the Midwest and South through Monday. 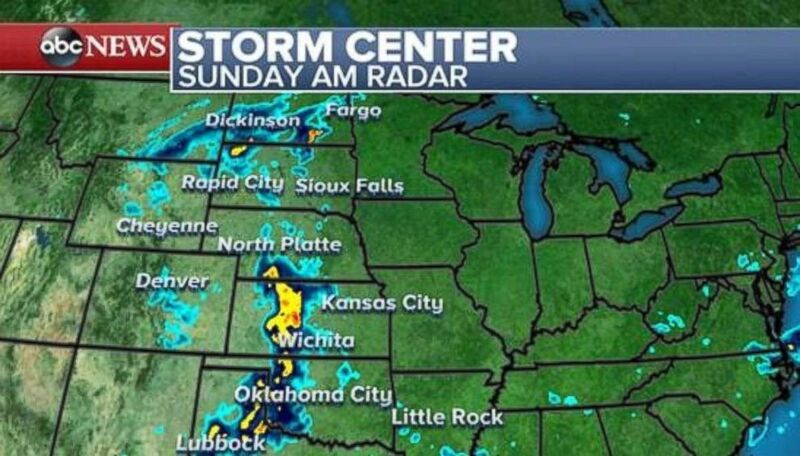 Heavy rain and strong thunderstorms have developed from Texas to Kansas Sunday morning. Scattered strong storms have also developed in parts of the Northern Plains. 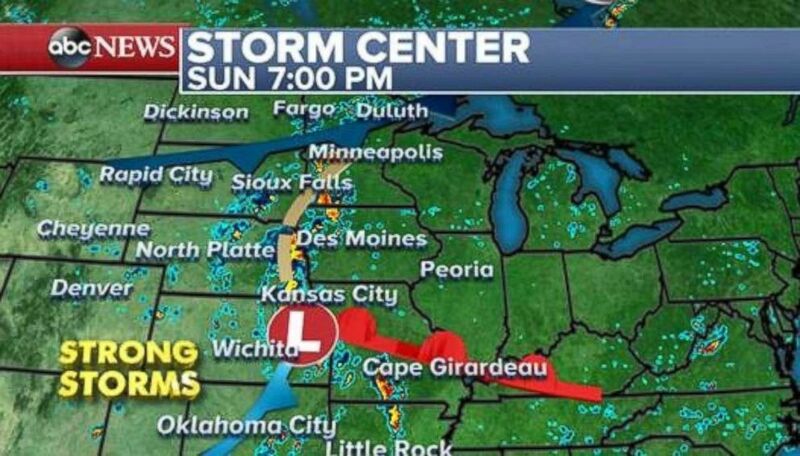 (ABC News) Storms are firing up in the Plains on Sunday morning and moving toward the Midwest and South. By late Sunday, strong thunderstorms will develop in parts of Oklahoma, Missouri and Arkansas, where gusty winds and torrential downpours will be the main threat. Of particular concern will be slow-moving, heavy rain targeting eastern Nebraska, Iowa and southern Minnesota. (ABC News) Strong storms are forecast for parts of Oklahoma, Missouri, and Arkansas on Sunday night. A more-pronounced storm system will develop in the heartland overnight Sunday into Monday. The greatest threat will be heavy torrential rain which could cause flash flooding in parts of the upper Midwest, including Iowa, Minnesota, Wisconsin and parts of Illinois. There could be 4 to 6 inches of rainfall locally through Tuesday in parts of the heartland -- especially Iowa. This could cause flash flooding in the region. Strong thunderstorms across the Gulf Coast and parts of the upper Midwest could bring 2 to 3 inches of rain through Tuesday as well. Localized flash flooding is a concern in these areas. 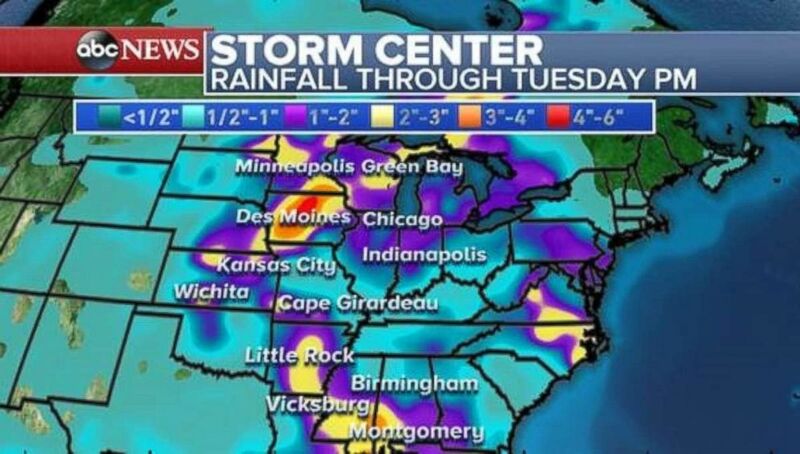 (ABC News) The heaviest rainfall totals through Tuesday will come in Iowa, Arkansas and southern Mississippi. After consecutive days of strong to severe storms, much of the Northeast will see drier conditions on Sunday. Only a couple of showers will remain in some coastal areas. As the latest system pulls away from the shoreline, storms will fire up across a slow-moving cold front in parts of Virginia and the Carolinas on Sunday. The chance for trailing thunderstorms in North Carolina and Virginia late Sunday into early Monday could cause localized flash flooding in this region. 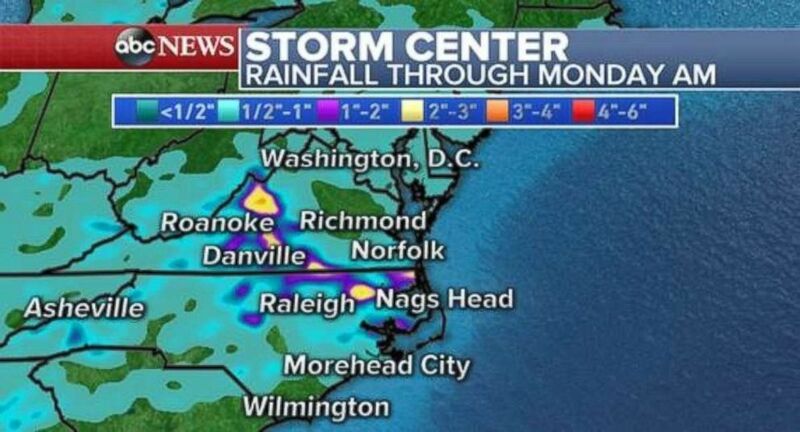 (ABC News) Rainfall will also be heavy in parts of North Carolina and Virginia through Monday morning. Hurricane Lane is a Category 3 hurricane with winds of 125 mph on Sunday morning. This dangerous hurricane is 970 miles from Hilo, Hawaii, and moving west at around 16 mph. Hurricane-force winds extend 25 miles from the center, and tropical storm-force winds extend 105 miles from the center. Lane will slow down in forward speed in the coming days and begin to lose some of its intensity. It will likely becoming a Category 1 storm by Tuesday. (ABC News) Some uncertainty exists as to Lane's track once we get to the middle of this week. The storm is expected to move in a generally westward direction through Wednesday, likely passing south of the Hawaiian islands. However, some uncertainty exists during the second half of this upcoming week. The forecast cone accounts for some of this uncertainty on Wednesday, as the storm begins to track a little more in a west-northwest direction. Therefore, the exact track of Lane and its proximity to Hawaii will determine if local impacts will become a concern later this week. 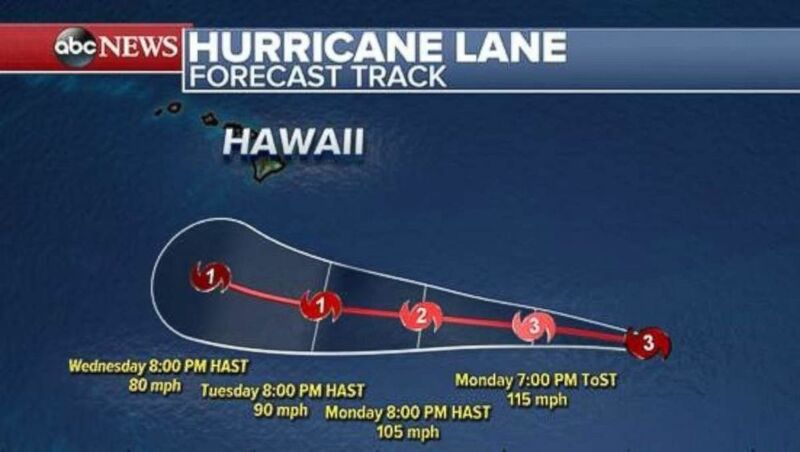 At this time, it is too early to determine if Lane will have any impact on Hawaii. However, per the Central Pacific Hurricane Center, those in Hawaii should monitor Lane over the coming days because the cone error is large in the Day 4 to 5 range.